The teeing ground is the area where play begins in a hole of golf. The terms tee, tee box, and "teeing ground" are synonymous. The name derives from the tee used to elevate a golf ball before striking it to commence play. The boundaries of the teeing ground are defined by a pair of tee markers. The front, left and right sides of the tee are denoted by the outer edges of the tee markers, assuming the perspective of a player standing in the teeing ground and facing the hole. The teeing ground is two club-lengths in depth. Most courses have at least three sets of tee markers (some may have six or more), each a different color and denoting different yardages. Some tee marker colors commonly used in the United States are below, along with a general description of who plays from what color. The tee box that a person plays from is not set by rules; in casual play, anyone can use any tee box they wish to. Note that not all courses have all colors, and some may use a completely different color scheme for their tee markers. Black or gold tee markers are usually used for championship play, for example professional or strong amateur tournaments. Most municipal courses are not equipped with this set of tees as very few public courses will hold serious tournaments. Blue tee markers usually denote the teeing ground used for local or club championship play in tournaments, and is the tee used by skilled male players who have a low handicap. This tee is almost always the longest yardage for each hole, unless the course has black or gold tees. White tee markers usually denote the teeing ground used most often by men, typically those who have a middle or high handicaps. This tee is almost always the middle tee between the championship and ladies tee and is often called the "men's tee". Red tee markers can have two meanings. If the red tees are behind the white tees, it is usually for championship play. More commonly, the red tees are located in front of the white tee markers and are often called the "women's tees". The forward tees usually offer the shortest yardage on the course. Green tee markers often have shorter yardage than even the red tee markers, and usually indicate where juniors and beginners hit from. Sometimes they are between the white (men's) and red (women's) tee markers and are used as the "senior" tees. Senior tee markers are for men 55 and over. They are typically gold or yellow (where gold is not used for championship tees.) Most players will enjoy playing from this position more. The USGA set the rule to speed up play. The tees are also used to provide a course rating from which scores can be posted to calculate a handicap, with longer tees providing a higher rating. Thus, theoretically a higher score can be posted from the longer tees without affecting the handicap. Not all tees will specify a rating for both men and women. For example, red tees will typically specify a rating for women, but not for men, and vice versa for championship tees. 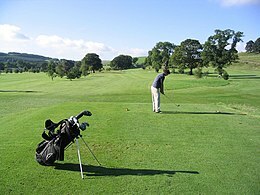 The surface of the teeing ground is generally grass, cut short shorter than a fairway but longer than a green to allow a true lie for balls struck with irons directly upon the turf rather than elevated and struck with a wood. USGA Rules do not specify that the teeing ground must be surfaced with grass nor the height at which it is cut. Blue (Tiger tees furthest from the green) confusingly the blue tees can also be the closest to the green. Yellow - typically used by men off all ages playing recreational golf. As playing from the wrong tee often incurs a penalty in golf, it is best to check before starting a round what the course conventions are at the club you are playing at. Relying on the rules at other clubs is no defence. "Teeing ground". "Rules of Golf", United States Golf Association. Archived from the original on April 4, 2005. Retrieved April 5, 2005.